There’s nothing like the power of corporate gatherings to unify a cause, restore relationships, bring healing, build community and empower individuals for the betterment of society at large. This can all start with an awesome theme! This book is a great resource for event planners, ministers, ministry leaders, organizational & program leaders, authors, writers, bloggers, radio & TV show hosts, coaches, magazine & book publishers and anyone looking for an awesome inspirational and empowerment themes for their upcoming event, program or project. Be sure to visit www.AwesomeEventSolutions.com for more awesome tips and resources when planning your next event, conference, program or project. Thank you for your interest and inquiry Linda. Please check your inbox. I sent you a private email. 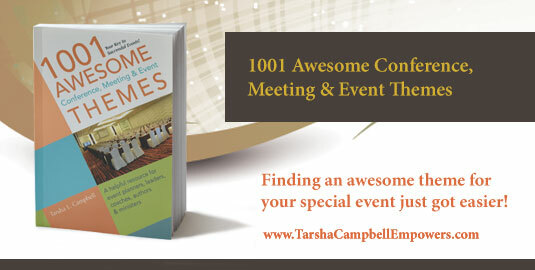 For your information The book is available for purchase on this website or you can purchase it and find out more information about the book at https://www.AwesomeEventSolutions.com. This helpful resource includes event themes for men, women, youth, young adults, seniors, marriage empowerment, singles, leadership, business, empowerment, arts/drama, prayer, prophetic, and much more! Get your copy today!